Mid July and it’s finally summer in Ireland. Everyone was afraid that week of perfect weather in May was it for the season. So, as the sun shines down on us, the gardens are finally coming into bloom. I picked zucchini, blossoms and parsley, kale and fennel that were as green as you would expect on the Emerald Isle. Zucchini blossoms are traditionally dredged in flour, milk and egg and batter fried or stuffed with meat and cheese. All these options are great but as a vegetarian, I’m trying to eat low fat and for the moment, I’m staying away from cheese. So, I created this scrumptious, healthy dinner that was received with rave reviews from my dinner guests. As one satisfied friend exclaimed, “the flavors are really developed!” Try it, you won’t be disappointed! Stuffed Zucchini blossoms over butternut squash-coconut puree Steam 1 medium butternut squash, let cool and save liquid for soup stock. Boil 2 cups of water, add 1 cup of quinoa and cook until done. This will produce about 3 cups cooked. While squash and quinoa are cooking, toast in the oven 2 Tbl, sunflower seeds and 2 Tbl. chopped almonds. 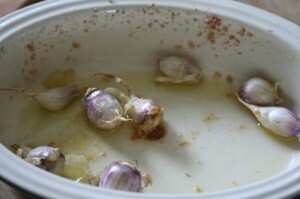 Separate 4 garlic cloves , put a little olive oil in a baking dish and roast until they become whilted and start to brown (as above). In a little olive oil saute 1 cup finely chopped kale, with 2 large button mushrooms and 1 medium oniuon. Steam 1 medium zucchini (courgette) in Ireland! let cool and puree. Squeeze water out. Chop 1 Tbl. fresh parsley and 2 Tbl. fresh fennel. Mix together parsley, fennel, nuts, sauteed veg. and quinoa. Pick of end of garlic clove and squeeze garlic into mixture. Add Zucchini puree and mix all together, add sea salt and cracked black pepper. Pick the stems off the zucchini blossom and wash lightly. Dry and stuff with filling. You can do this by tearing a side and rolling or just filling it up. 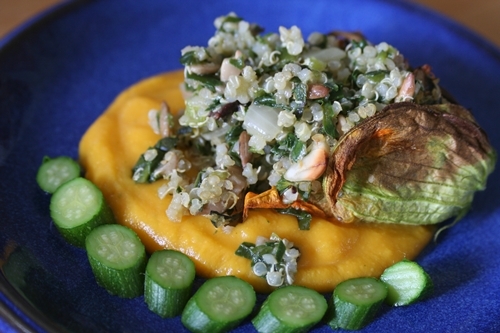 Puree the squash with 2 heaping Tbl. creamed coconut, 2 Tbl. minced ginger, 2 Tbl. chopped fennel, a whole lime juiced, sea salt , black pepper and a very small dash of cayenne pepper. The consistency will be smooth and creamy. Place 1/2 the puree in a baking dish, lay the blossoms over and cook for 20 minutes at 350, gas point 4. Have fun garnishing with baby zucchini, herbs, lime wedges. Enjoy this delicious, healthy vegan meal! Shopping List: quinoa, zucchini, blossoms, fennel, parsley, sunflower seeds, almonds, kale, mushrooms, onion, garlic, creamed coconut, butternut squash, fresh ginger root, lime, cayenne pepper, sea salt, black pepper. Having tired of the same old chick pea hummos, as good as it is (!) I decided to try something different to serve as an appetizer. This little plate of summer fresh delicacies are straight from the garden. 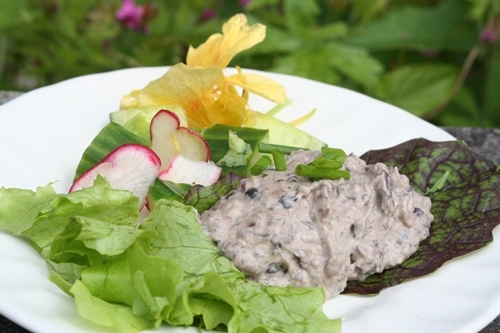 A mixture of lettuce, rocket, mustard greens, cucumber and radish make up the bed for a delicious black bean hummos that can be served as a dip, as a filling in pita bread, or just simply with a little salad such as this. Decorate with chives, tangy edible flowers, drizzle with fresh squeezed lime juice and serve with a crusty piece of bread or cracker. Ah summer! In a food processor pulse 2 cups of cooked black beans. Slowly add 5 Tbl. tahini (sesame butter), 4 Tbl. fresh squeezed lemon juice, 2 Tbl. light olive oil, 3 large garlic cloves, sprinkling to taste of fresh minced cilantro (coriander), paprika, cumin, red pepper flakes, sea salt and black pepper. Blend all together until smooth. Add enough spring water until it is a smooth consistency. Enjoy!